Yes this is totally a "first world problem" but I want my package! Today I tried something new - smiling with teeth rather than just smizing at the camera! I'm usually very uncomfortable smiling in photos since I don't really have a chin and when I smile that particular affliction becomes more noticeable. 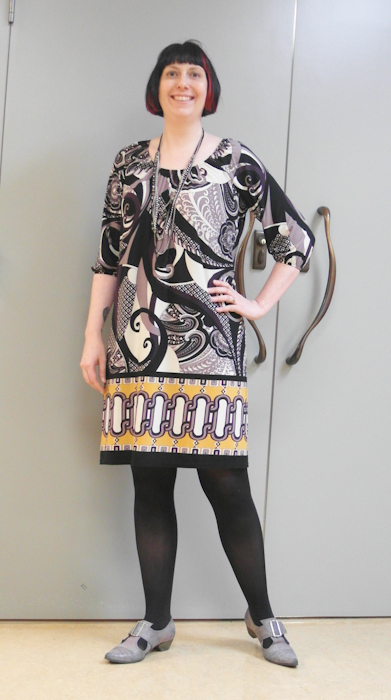 Focusing on the positive, I like how this dress emphasizes my favourite body part - my neck. Pretty psychedelic dress, eh? I almost didn't buy this dress because the purple and yellow (gold) combination reminds me of high school. These were my school colours. Eck! I bought these shoes at the Gastown store in Vancouver in 2010. I almost didn't get this colour because I didn't think it was very versatile but I'm glad I took a chance. I also wasn't sure about the "white wax" coating but I really like how the blue colour underneath is starting to show through as the wax starts to wear off. 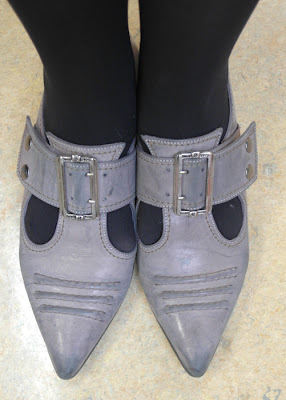 These shoes were the shoes of my dreams in the 1980s. Pointy toes, big buckles - glad I can have them now. I also have a pair of my other dream shoes, the Munster. If only I had the courage to wear them. Beautiful dress, I think it highlights your long pretty neck well. Also I think you look lovely smiling with teeth. I experience a similar issue when smiling with teeth. I also squint and lose my eyes. Heehee. Omg, I cannot tell you how much those pilgrim shoes have haunted my dreams. The Munsters are still a little too out there even for me though. They're interesting as a piece, but on feet I still kind of have that "Huh." reaction. That's a lovely dress! I really like the patterns. The Pilgrims always look so weird to me until I see them on someone's foot and then I like them. I want the purple ones. You have a great smile, Megan! I love this printed dress, very unique! Through my non-high-school-tinted glasses, this outfit is wonderful! I love, love the dress with that colourful border along the hem. I like your teeth too! It's weird at first but soon you'll be smiling like a toddler with a tiara. Yikes!! Forget I wrote that. Seriously, I love that smile. Woo, that dress is a bit trippy! I like it though, it's fun. You always have such fun patterned things!